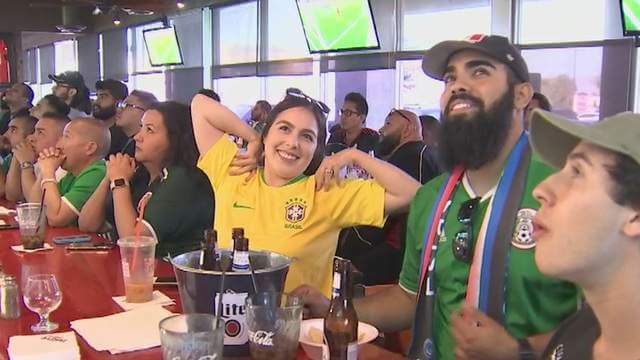 PHOENIX (KSAZ) – On Monday, Brazil brought an end to Mexico’s run in the 2018 FIFA World Cup, but before that, fans of Team Mexico were out in force in Laveen to watch the games. 7:00 a.m., and hundreds of fans have already packed Native Grill and Wings, after Mexico slid into the round of 16. At the start of the game, fans wonder if their team would break through to the quarterfinals after repeated failures in past World Cups. After half a game, they held mighty Brazil to a scoreless draw, and fans were feeling good. “Brazil is attacking, but Mexico second half, we will score a goal. 1-0 that is all we need. We are going to advance to the quarterfinals,” said Alex Perea. Here and there in the pro-Mexico crowd, we saw a yellow Brazil jersey. In the end, Mexico’s trying its hardest just wasn’t quite good enough, as Brazil shut Mexico down in the second half for a 2-0 win. Sweet for brazil fans, but more heartbreak for Mexico. It was not quite the result by any stretch that Mexico fans wanted, but it did not, in any way, dim the spirits of these fans, as they sang and cheered long after the final whistle.